Steeped in tradition, 2017-18 Panini NBA Hoops Basketball signals the start of a new year as the popular brand returns for another season. 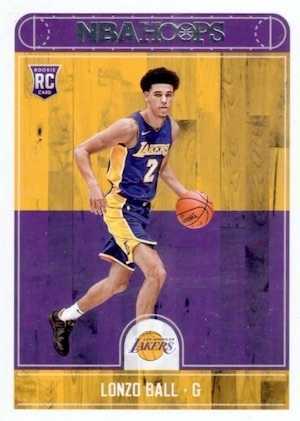 Giving collectors an early option for notable names, the 2017-18 Panini Hoops Basketball checklist covers star veteran players and features the very first rookie cards for the top names from the 2017 NBA Draft, including Lonzo Ball. 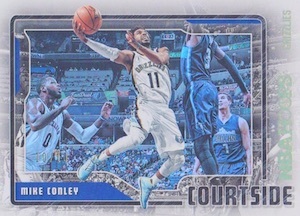 As with previous Panini NBA Hoops products, the base set also offers several parallels, with choices like Artist Proof, Artist Proof Black, and Gold. Displaying more variety, retail-only base parallels include Blue (Blasters), Teal Explosion (Fat Packs), Teal (#/125 - Gravity Feeds), Blue (#/75 - Retail), Orange Explosion (#/75 - Fat Packs), Red (#/49 - Blaster), Orange (#/25), and Red Checkerboard (#/15 - Retail). Not forgetting the past, Kobe Bryant Career Tribute continues the celebration of the "Black Mamba’s" legacy, which is honored with a 10-card set. 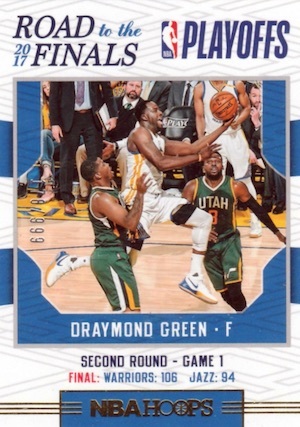 Meanwhile, Road to the Finals tracks key moments from the playoffs through the NBA Finals, and contains a rare card for the Finals MVP (#/99). Additionally, Back Stage Pass, Courtside, Special Delivery, Team Leaders, and We Got Next are hobby-exclusive inserts. Parallels add to the chase with Artist Proof (#/25) and Gold (#/10). On the other hand, retail-specific inserts include Class of 2017, Lights Camera Action, Faces of the Future, Swat Team and Zero Gravity. 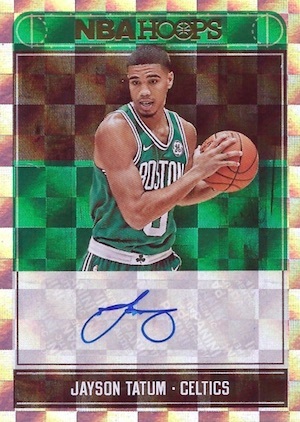 Only found in hobby formats of 2017-18 NBA Hoops Basketball, Hot Signatures and Hot Signatures Rookies autographs again bring the Red Hot Signatures (#/25) parallel. Finally, retail autographs are included in the Great SIGnificance set, while Rise N Shine Memorabilia and Rookie Remembrance relics are exclusive to blaster packs. These both have Prime parallels limited to 25 copies or less. 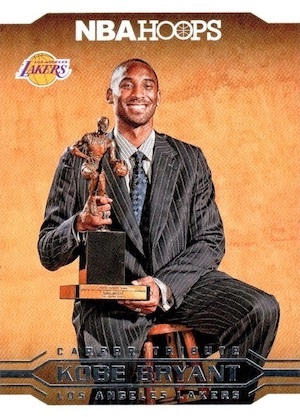 300 cards, including 10 Kobe Bryant Tribute cards. Shop for complete base sets on eBay. PARALLEL CARDS: Blue, Red Backs, Teal Explosion, Platinum, Premium Box Set #/199, Silver #/199, Teal #/125, Green #/99, Blue Checkerboard #/75, Orange Explosion #/75, Red #/49, Artist Proof #/25, Orange #/25, Red Checkerboard #/15, Gold #/10, Artist Proof Black 1/1. PARALLEL CARDS: Blue, Red Backs, Teal Explosion, Premium Box Set #/199, Silver #/199, Teal #/125, Green #/99, Blue Checkerboard #/75, Orange Explosion #/75, Red #/49, Artist Proof #/25, Orange #/25, Red Checkerboard #/15, Gold #/10, Artist Proof Black 1/1. AUTOGRAPH PARALLELS: Autographs Premium Box #/20. 90 cards. Hobby only. Shop on eBay. PARALLEL CARDS: Red Hot Signatures #/25. PARALLEL CARDS: Artist Proof #/25, Holo Gold #/10. 19 cards. Serial numbered #/99. Shop on eBay. 1 card. Serial numbered #/99. 100 cards. Retail only. Shop on eBay. I am disappointed that the price was raised and there are less cards than last year’s Hoops. 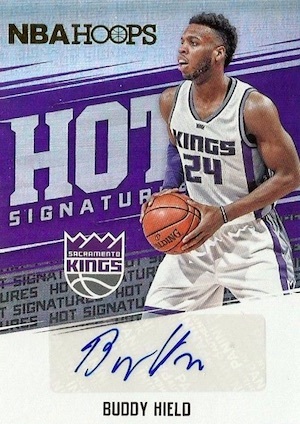 The fact that autos for top RC/Stars like Josh Jackson and Kevin Durant are only available through Panini Rewards, just shows Panini has no idea what they are doing! Not wasting my money on this product. 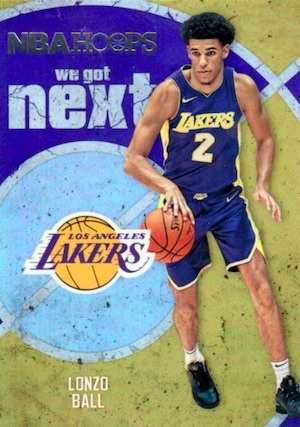 Prices are ridiculous on E-Bay for certain rookie singles like Lonzo Ball but then again its the first day of release and people are apparently willing to pay ridiculous prices for the cards. Usually I wait a few weeks or even months for other products to be released which instantly softens the prices for the cards I want. Somehow I was lucky enough to find a high rated seller listing the entire hand collated base set including all of the rookies for $35.00. What would be nice if hockey and basketball would have factory release base sets like Topps does with its flagship brand for baseball and Panini does with its Donruss football brand. I like Hoops every year. It isn’t for the investor but it’s always fun to break a couple blasters until the other sets come out. I think the Shaq tribute set has a parallel version. I got some type of holofoil version in my blaster as well as a base white bordered one. Two autographs per box, huh? Just bought one and the only autograph was Robert Covington. Not the first time I’ve been told x-number of autographs per box only to get less than that or none. 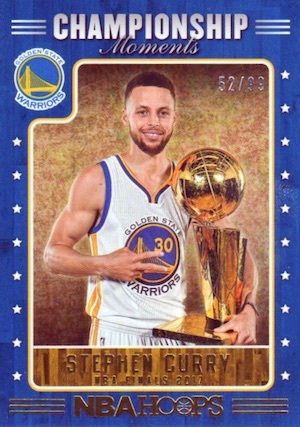 A new company needs to make NBA cards. Is Panini doing a Panini Complete set this year? Great set of cards. Lots of RC’s and parallel sets. Particularly like the Orange #/25 and Orange Explosion #/75. Wish the autos were on-card as most are stickers. But for the price great selection, nice looking product. Looks like no Complete cards this year. Hoops, I guess is Complete with Foil. A Fine effort. Wish player photo occupied most of card but a great low end set to collect. I got an awesome deal for a Hobby Box of these cards from a local card store today. The box was 65% off as the store owner is cleaning out older inventory to make room for the newer stuff. I pulled a card again that’s not listed in the checklist for these cards. I pulled a refractor of some kind from the Shaq NBA 2K set. 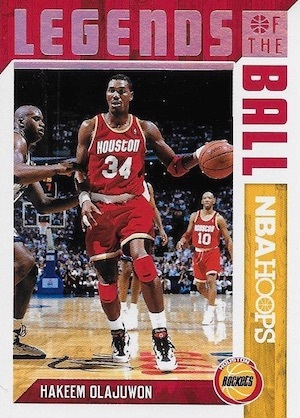 On the back of the card it’s showing as #34 which is not a number for the NBA 2K Shaq set going by the checklist. The card looks like a refractor but the card is not serial numbered. Just #34 on the back. Trey, do you have any clue as to what type of card this might be? 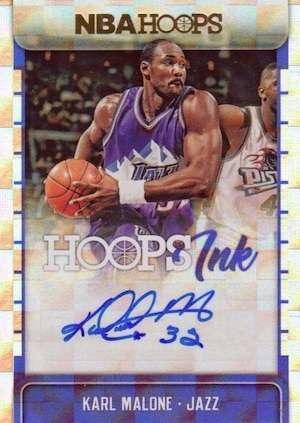 I pulled other NBA 2K Shaq cards from this set & they match up with the checklist. They are just regular looking base set cards but this one with the #34 on the back is a refractor or hologram of some type. It appears to be an 11th card in the set. The only difference is the foil finish. I see several on eBay. While it is #34, that is his jersey number and I don’t see any other missing cards from the list.